Play Audio vs. Download | Russ & Gary's "The Best Years of Music"
Our blog is powered by WordPress.com. Music on our blog is stored as audio files in the mp3 format so that it can be heard as you read about it. It cannot be downloaded. It can by heard by clicking the Play symbol of an (embedded) Audio Player. The Flash player, is temporarily disabled while we investigate a potential security issue with it. Not all browsers’ native players share the same security issues, so as long as you’re viewing an audio file in a browser that supports it, you’ll see a player. If not, you’ll see a download link. The Flash player will return as soon as we’re confident that the Flash player itself is safe, until then, the folks who are using a browser which does not natively support the embedded format will see a download link instead. Chrome natively supports: .mp3, .m4a, .wav, and .ogg. Safari natively supports: .mp3, .m4a, .wav, but not .ogg (which will display a download link). Firefox natively supports: .wav and .ogg, but not .mp3 and .m4a (which will both display a download link). Opera natively supports: .wav and .ogg, but not .mp3 and .m4a (which will both display a download link). Internet Explorer natively supports: .mp3, but not .m4a, .wav, and .ogg (which will all display a download link). 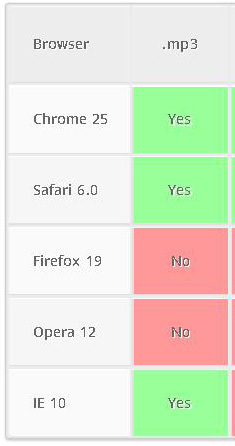 What formats a browser chooses to natively support is entirely up to the browser’s developers, we have no control over that. Until now, we have given the Flash player precedence, fallen back to the browser’s native player when Flash isn’t available, and then fallen back to the Download link when the format is not supported by the browser. With the Flash player temporarily disabled for security concerns, we are giving the browser’s native player precedence and falling back to the Download link when the format is not supported by the browser. Whether it’s via an embedded player or a Download link, all of your viewers will be able to play the audio files.